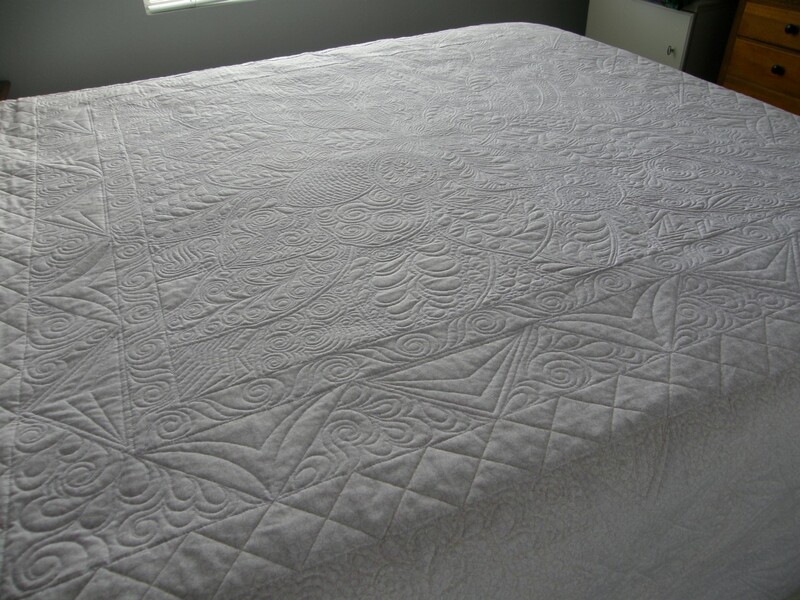 Quilted on my Innova longarm, Warm and White batting. The back is actually a pale lilac. DD's birthday is 11/25, and this will be a surprise. Oh wow Dunster! That is jaw dropping gorgeous! And probably the prettiest use of the Dream Big Panel I have seen. You designed an awesome quilt and then put it over the top with all that gorgeous quilting. I bet your DD was/will be thrilled as you not only met her criteria but knocked it right out of the park. Wow, that is just gorgeous. Beautiful quilting too. Dunster, what a wonderful surprise that will be! It's absolutely gorgeous!!!!!!!!! Just super. She will love it. WOW! That is a beautiful quilt. Love the fabric colors and the quilting is awesome. 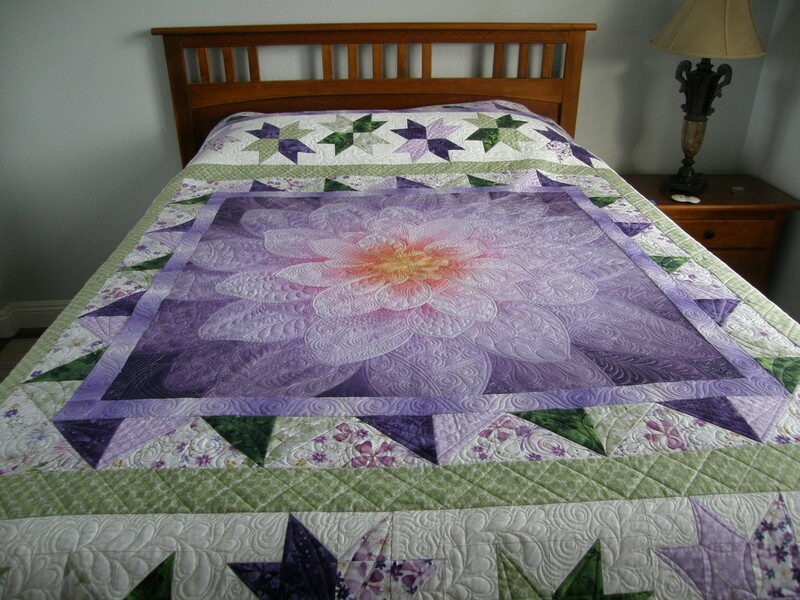 ​Lovely quilt and such a nice colour combo of green and lavender! Oh I'm smitten with your gorgeous quilt! 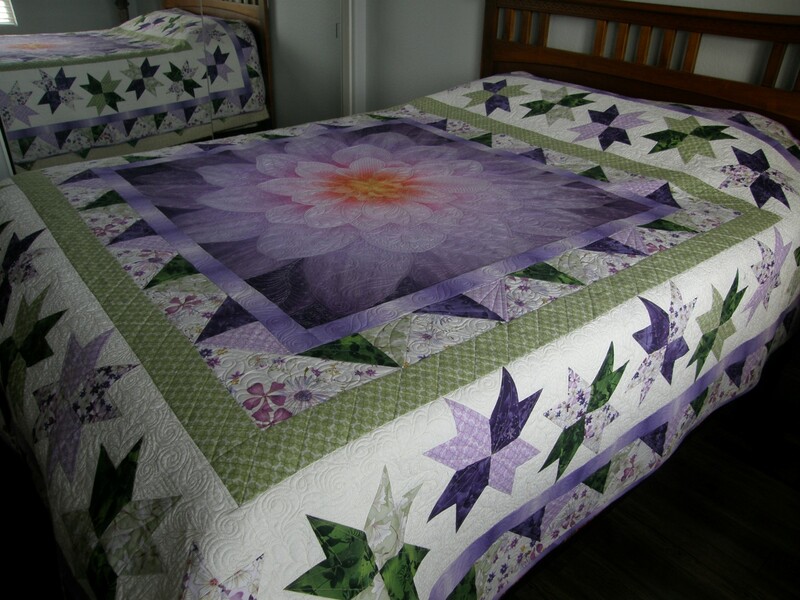 I love every aspect of your creativity - the lavender panel is spectacular, your medallion design is a perfect frame, your fabrics are beautiful and the quilting - the quilting is stunning! And the best part is that it's a wonderful surprise for your daughter. She is sure to be over-the-moon when she receives it! Absolutely beautiful! Love the colors, the design, the quilting! Oh my goodness, how absolutely gorgeous. That is really beautiful! Great choice of fabrics. Wonderful pattern design, piecing, and FMQ. Your daughter will love it! Incredible...I love the quilting and how the borders set off the center panel. Your quilt and quilting is just awesome. Love the flower in the middle. Love the color combo and of course your piecing and especially your quilting. Gorgeous work. Wow! Wow! and Wow again. That came out just great. You must take a picture of her when she sees it. Absolutely gorgeous quilt, quilting and colors. What a beautiful surprise for your daughter! The quilt will be treasured. Love how you highlighted the panel with the quilting motif and the star blocks are wonderful...I really like the floral fabric you used in the quilt too.